No Episode 9 title until mid/late February ? 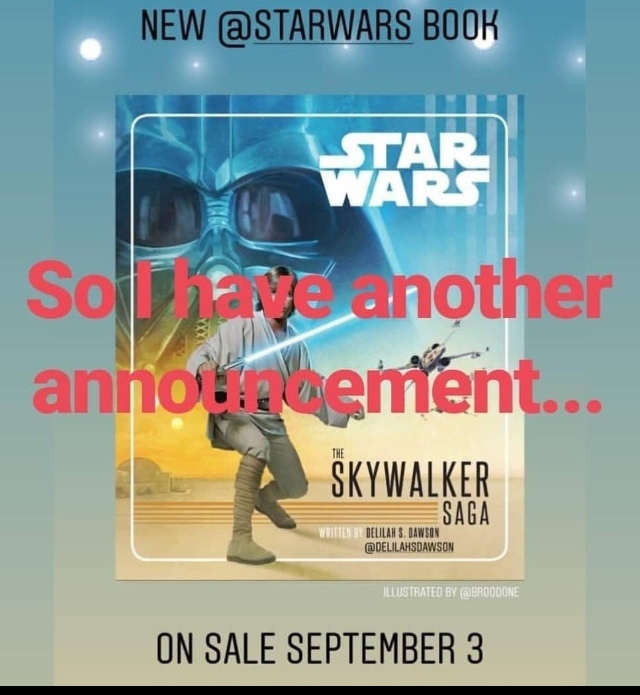 I Put it here because this is from a cast member of Episode IX so it doesn’t sound like the title is imminent. Also sounds like filming will go on till end of February. Who will be there till the end I wonder ? So if filming really runs that late, I wonder when Adam is headed back to NYC for his play? @justyou wrote: So if filming really runs that late, I wonder when Adam is headed back to NYC for his play? He probably will fly in and out. That's what he usually does. This past weekend he flew to Sundance directly from London on Saturday, then on Sunday he flew to LA for the SAG awards then he flew back to London on Monday. I assume he is going back to LA this weekend again for the Oscars luncheon and then if he still hasn't wrapped his scenes yet he will probably do one or two more weeks of IX filming before staying permanently in New York for rehearsals in mid Feb. I heard previews start Mid March and premieres on April 16th... Apparently is only a short limited run until May or June. It’s interesting though that Luke and Vader are on the cover and no Ben/Kylo or leia . If it comes out in Sept then I doubt the plot contains spoilers or insight into Kylo. Looks like it might concern young Luke and his story with Vader. Burn This doesn’t close until July. Play rehearsals usually start around 6 weeks before they do it in front of an audience so I would expect Adam to be in NY after the Oscars lunch. He will presumably fly back to London for the BAFTAs the following weekend though so he might not have wrapped on IX yet. @Lovely_Rose wrote: If it comes out in Sept then I doubt the plot contains spoilers or insight into Kylo. Looks like it might concern young Luke and his story with Vader. Think on Tumblr, it mentions it goes all the way to VIII, perspective of the Skywalkers. Some EP 9 info from the MSW podcast. - The four-minute trailer was shown to the crew, it had incomplete VFX. It was cut down to a two-minute-ish trailer. - Jason doesn't know when the trailer will drop. - According to Jason, it sounds like they could promote IX more like how they promoted Rogue One - more emphasis on military. - There's some ice cave on the set. Yeah makes sense (re:military). The Resistance vs First Order plot is the easiest and most expected way to promote the movie. We all know who is going to win and there's the added bonus of pew-pew to entertain the crowd and get them hyped. As usual, we'll probably have to rely on the promotion in Japan to get some Reylo tidbits. @Man Without A Star Thanks for the heads up. I'll give the MSW podcast a listen - and filter it through the cast's biases. LOL. I won't read too much into it, but I wonder if part of the reason they are focusing on the military aspect, besides John saying it's a war to end all wars, is because the Force scenes are too spoilery for a teaser? @rawpowah wrote: Yeah makes sense (re:military). The Resistance vs First Order plot is the easiest and most expected way to promote the movie. We all know who is going to win and there's the added bonus of pew-pew to entertain the crowd and get them hyped. I agree. Even though I personally find it rather , I always thought a lot of the marketing outside Asia would focus heavily on the Resistance vs. the First Order as it’s the safest and least spoiler-ish way to hype the movie. The military aspect is OK, but I feel like they should also be heavily promoting the major themes of this trilogy with the final film, which is the balance in the force and Reylo. Even if it's spoilery, they need to be a bit more revealing with the audience this time around. I was also secretly hoping that Rey and Kylo would get the Anidala promo treatment, with magazine covers and photoshoots and such. It would be disappointing to not see that. @Lovely_Rose wrote: The military aspect is OK, but I feel like they should also be heavily promoting the major themes of this trilogy with the final film, which is the balance in the force and Reylo. Even if it's spoilery, they need to be a bit more revealing with the audience this time around. I was also secretly hoping that Rey and Kylo would get the Anidala promo treatment, with magazine covers and photoshoots and such. It would be disappointing to not see that. I am hoping that we get one Adam/Daisy photoshoot at some point. It's the last chance to do it! Also praying we get some joint interviews for once. If the promo for this movie is going to be the good guys vs the bad guys all over again like TFA I am going to be disappointed. @Kessel wrote: I agree. Even though I personally find it rather , I always thought a lot of the marketing outside Asia would focus heavily on the Resistance vs. the First Order as it’s the safest and least spoiler-ish way to hype the movie. I can't say I've ever seen anyone go, "wow I can't wait for the Resistance to take on the First Order, I'm so hyped". @ZioRen It really does stand in contrast to the way most other films are marketed. It's good not to show all the best parts in the trailer, as so many do, but it also allows people to create their own unrealistic (even delusional at times) expectations, then be unreasonably mad when they don't happen. The ST is so far down the pipeline, and SW fandom was so hypersensitive even before that, revealing anything could create an avalanche of ill will. But also not giving people something to grab a handle on will also create discontent. I swear there's no winning. I don't envy LF and Disney's marketing and PR. although- I had to admit I really loved the first official trailer for TLJ...it can still give me goosebumps when I watch it even over a year after the movie is out. I think that was very well put together...teasing without revealing too much. I was so funny how everyone speculated it was ALL misdirection, when imo it was honest about the main themes of the story. @californiagirl wrote: @ZioRen It really does stand in contrast to the way most other films are marketed. It's good not to show all the best parts in the trailer, as so many do, but it also allows people to create their own unrealistic (even delusional at times) expectations, then be unreasonably mad when they don't happen. Yeah it's a tough balancing act, but I feel like there's fault in tailoring marketing to superfans, so to speak. As in getting caught up in the hype and eagle eyes, and the tendency to complain, of superfans and thus hiding "spoilers" to huge levels and keeping quiet as long as possible. But most of the ST's audience will never be looking that hard into every single potential spoiler and detail. It seems like TPTB are shrouding and downplaying in their marketing tactics too much just to pull the veil over the eyes of a relatively tiny percentage of the people who will watch the films. And it feels like they've lost some potential hype in the process. I remember that most people I knew didn't even realize TLJ was coming out until really, really close to its actual release date. It almost caught them by surprise, like it suddenly blinked into existence for them less than a month before the movie's release. With how big a cultural phenomenon and household name Star Wars is, that really shouldn't be the case. It especially shouldn't be the case for the big trilogy closer! They definitely lost the hype for Solo. The marketing was non-existent, at least in my part of the world. The movie was so quietly put in cinemas, that the theater was only 5% full when I went with my family on a Thursday night premiere. It never happened with a SW movie before, ever, and I have been watching SW in cinemas since the early 1980s. They screwed that one big time. It should have been released in fall 2018, not in spring.